ICMP is pleased to distribute the conclusions of a two-day conference hosted by ICMP in Skopje, FYROM/Macedonia, on 20 and 21 November,, entitled “The Future of the Missing Persons Process from the Kosovo Conflict.” The conference gathered representatives of family associations of missing persons, government representatives from Belgrade and Pristina, as well as representatives from the international community, including EULEX and ICRC. The International Commission on Missing Persons (ICMP), “Amnesty International” and “TRIAL – Track Impunity Always”, publish a set of joint recommendations calling on the Government of Iraq to take decisive steps to tackle and end the practice of enforced disappearance in Iraq. 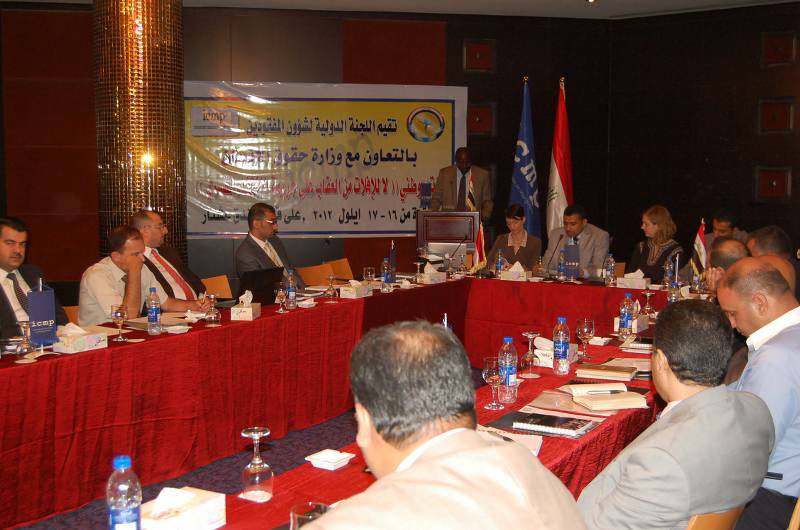 The recommendations are the direct outcome of a conference ‘No Impunity for Enforced Disappearances’ held by the ICMP in cooperation with the Ministry of Human Rights in Baghdad, 16 and 17 September 2012 (download the report). The Government of the Czech Republic has announced that it will provide further funds for the work of the International Commission on Missing Persons (ICMP) through June 2013. On this occasion, the Ambassador of the Czech Republic to Bosnia and Herzegovina H.E. Tomas Szunyog visited ICMP’s headquarters in Sarajevo where he signed a donation agreement with ICMP Director General Kathryne Bomberger. ICMP hosted a two day conference entitled, “The Future of the Missing Persons Process from the Kosovo Conflict” in Skopje, the Former Yugoslav Republic of Macedonia. The conference gathered together representatives of family associations of missing persons, government representatives from Belgrade and Pristina, as well as representatives from the international community, including EULEX and ICRC. A two day conference organized by the International Commission on Missing Persons (ICMP) and titled “The Future of the Missing Persons Process from the Kosovo Conflict” started today in Skopje, the Former Yugoslav Republic of Macedonia. Representatives of family associations of missing persons as well as government representatives from Serbia and Kosovo are attending, in addition to relevant experts and representatives of the international community. ICMP Director General Kathryne Bomberger and the Libyan Minister for the Affairs of Families of Martyrs and of Missing Persons, Naser Jibril Hamed, signed an agreement on cooperation in Tripoli today to address missing persons cases from the recent conflicts as well as from the 42-year regime of Muammar Gaddafi. British Foreign Secretary The Right Honourable William Hague MP visited the headquarters of the International Commission on Missing Persons (ICMP) today during his visit to the region. Mr. Hague was briefed, by ICMP’s senior staff, about the work of the organization in the region of the Western Balkans and its broader global engagement in the Middle East, North Africa, Latin America and South East Asia. Discussions were held about the future of the organization, including its international status, headquarters and the critical need of the organization as a global resource. Mr. Hague also asked if ICMP could extend its technical capacity to work on cases of sexual violence committed during conflict. Following a two-day meeting organized by the International Commission on Missing Persons (ICMP) on 15 and 16 October in Bosnia and Herzegovina, representatives of the BiH Missing Persons Institute, Administration on Detainees and Missing Persons of the Republic of Croatia and the Government Commission on Missing Persons of the Republic of Serbia agreed upon future steps to create a regional list of missing persons. A delegation of 25 members of the European Union’s Working Group for the Western Balkans (COWEB) led by H.E. Ambassador Peter Sørensen, Head of the Delegation of the European Union to BiH/European Union Special Representative, visited the headquarters of the International Commission on Missing Persons (ICMP) in Sarajevo today. The delegation was received by ICMP’s Director-General Kathryne Bomberger, where it was briefed about ICMP’s assistance to the countries of the Western Balkans and to other countries around the world.